Durham and Northumberland Rugby between Sunderland RFC (white) and Whitley Bay Rockcliffe, played at Ashbrooke Sports Ground, Sunderland. 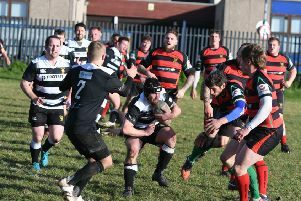 A sizeable crowd gathered despite the blustery conditions, and saw the game start at a frantic pace, with both sides playing fast, attacking rugby. The visitors got off to a flying start, opening up a 12-point lead within 21 minutes, the first coming as Sunderland missed key tackles and the second as Rockcliff’s pack worked phases to drive over the line. Sunderland came back into the game and ended the half the superior side. On 29 minutes, a maul was fashioned from a shortened lineout and as Rockcliff committed numbers, the ball was span out to find Leon Ryan who, from full-back, powered through then around defenders to score out wide, then convert. Ryan capped off a fine team effort with his second on 31 minutes. Sunderland worked phases down the right and worked the ball back inside. Fletcher Jackson offloaded to Ryan, who had picked a strong support line from deep to gas defenders over the last 15 metres. Rockcliff conceded a penalty on 33 minutes, slotted by Ryan, and Price showed pace, power and determination to grab a try on 40 minutes to end the half 22-12 up. Ten minutes into the second half, a further penalty from Ryan took the score to 25-12. But Sunderland then tried to run the ball out of their own 22 and Rockcliff intercepted a pass to run in their third try. 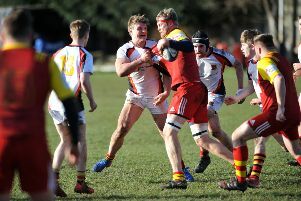 And Rockcliff drew within a point of Sunderland when Dean Edmundson was adjudged to have committed a high tackle on an opponent in the act of attempting to ground a try, resulting in a yellow card and a penalty try. Sunderland withstood pressure and, unbelievably, just before Edmundson was allowed back on, Andrew Wordsworth was shown yellow for taking out the scrum half at the breakdown, effectively consigning the hosts to play the final 20 minutes with 14 men. With a minute to play, Sunderland were awarded a lineout on their right, near the 22m line. The lineout had worked well all day and Sunderland had taken their fair share of Rockcliff ball, but not on this occasion. As the ball winged its way to the rear, the respective jumpers came together and a Rockcliff penalty was awarded as their man had been taken in the air. The kicker held his nerve to slot the kick, pushing Rockcliff into a two-point lead. Sunderland turned over possession from the restart, but with time up a knock-on in attack brought the thrilling encounter to an end with Sunderland defeated 25-27. “Sunderland’s attitude, passion, skill and ability were not in doubt,” said a club spokesperson.